Halloween is our youngest son’s favorite holiday. He plans his costume months in advance, has dress rehearsals, and serious discussion with his fellow Halloween loving friends. I am not exaggerating one iota, Halloween is his thing. I have no idea where or when he got this Haloween costume gene but it is such a fantastic joy to watch him be so excited this colorful, fun-filled holidays. To celebrate the joy of Halloween each year we give our kids Halloween gift baskets. These baskets are not brimming with sugary treats. Heaven knows, they get enough of that stuff from their grandparents and trick or treating. 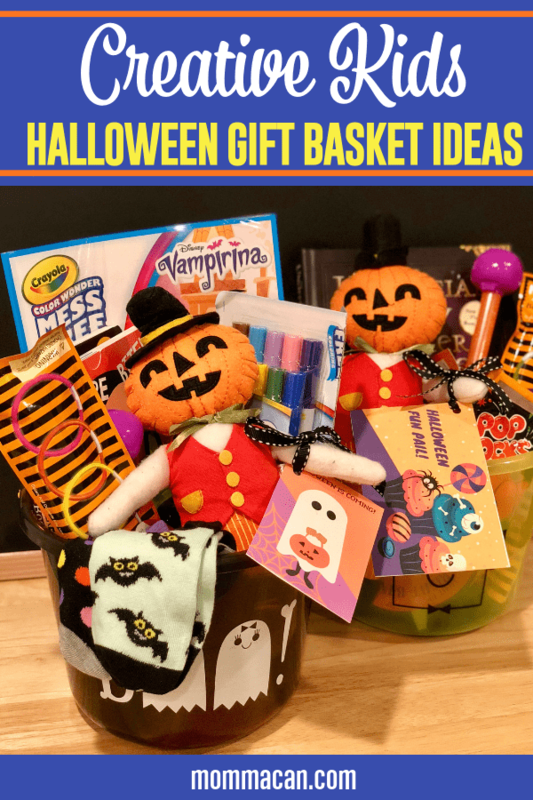 We do fill the baskets with themed books, pajamas, sticker books, glow in the dark bracelets, and all kinds of fun Halloween goodies. Kids Halloween gift baskets are so much fun to make and give. The biggest plus is you can fill a pretty good basket for your kids at Target, Walmart, or the Dollar store for very little money. I try to put one thing that I know they will love, usually a good book. They love their Halloween pajamas, they start wearing them the minute they receive their gift basket. The kids never know when their Halloween Bucket will arrive, yes I said bucket. My oldest started calling them buckets because they have a handle, and the name just stuck. And now, that my oldest has his own little Halloween baby, I have one more little one to create a Halloween Fun Bucket for each year! Big Trick or Treat Bag – these are lighted! Harry Potter Items: This year we are giving our youngest son the Unofficial Harry Potter Cookbook ! Halloween Pajamas – Yes, another photo op for moms to share on Instagram! Psst! Why limit Halloween dress up to one night! Have a costume party for friends and family or better yet, have one just for your family. Finally, we can get dad into that Han Solo vest and mom into Princess Leia side hair buns! Here is a list of dress-up goody ideas. And last but not least, just a few Halloween treats. Gift Tag Instructions – Print on white cardstock , cut along lines. Optional, take to cards from pattern page and glue together for an even more creative gift tag. Hole punch at the top, or whatever suits your basket design best. Then add ribbon and tie gift tag to the basket. You can also just take the card creatively into the basket, which looks wonderful as well! 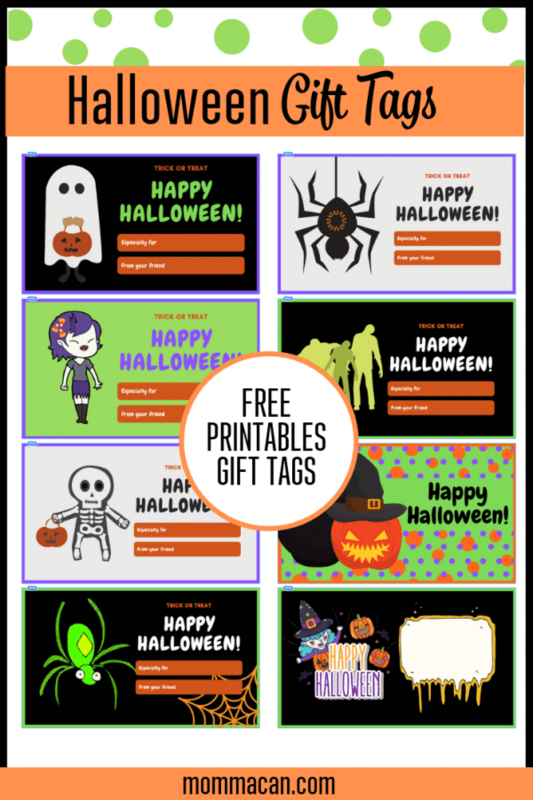 Don’t miss the free gift tags! Remember, less is more. The fun thing about Halloween is spending time with family and friends. 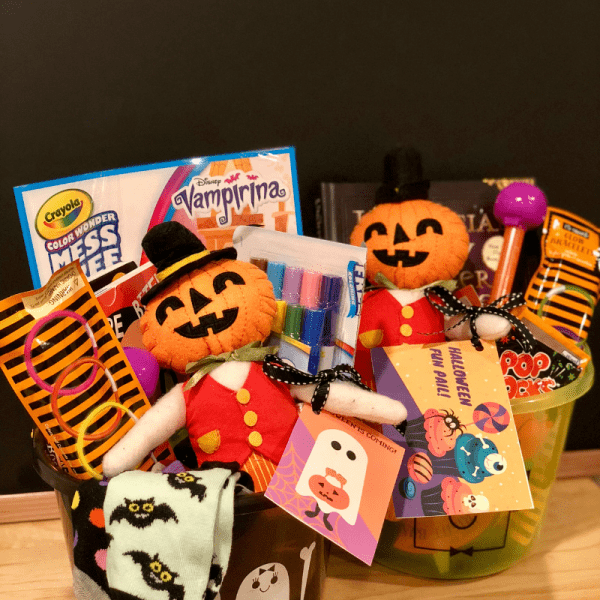 The Halloween Fun Pail or Gift Baskets are just a fun way to kick of the season! I hope you have enjoyed Creative Kids Halloween Gift Basket Ideas and will check out our other Halloween posts here. Momma Can’s Halloween Posts!